The cerebral neocortex is responsible for higher brain functions, such as conscious thought and language, in humans. In the neocortex, neurons are precisely arranged in an ordered 6-layered structure. This neocortical structure is formed by the sequential generation of billions of neurons and their migration toward the brain surface in the fetal period. "Subplate neurons" are one of the first types of neurons born in the neocortex. They work transiently during neocortical development and disappear when development is complete. However a function of subplate neurons in neuronal migration had been unknown. Synapses are structures that connect neurons. In mature neurons, synapses are critical for allowing neurons to communicate with each other, and this communication is essential for virtually all neuronal functions. However, a role for synapses in neuronal migration during cortical development had also not been known. In this study, the research team found that subplate neurons form transient synapses with newborn neurons, and send signals to control their migration. "We found that a special type of neurons, subplate neurons, control migration of newborn neurons by communicating with them through synapses. We were really surprised by this since synapses are thought to be structures used by mature neurons. This is the first time that synapses have been found so early in development." said Chiaki Ohtaka-Maruyama, PhD, a lead author of the study. The research results was published in Science on April 20, 2018. During neocortical development in the fetus, neurons are born deep within the brain from repeated cell divisions of neural progenitor cells. Subplate neurons are the first neurons born in the neocortex, and they form a layer called the subplate layer. After generation of subplate neurons, neural progenitors next generate enormous numbers of excitatory neurons, which then migrate en masse toward the brain surface, where they form the different layers of the neocortex. When excitatory neurons are first born, they are star-shaped, or multipolar, and migrate in a slow, meandering manner without a set direction. This type of migration is referred to as multipolar migration. However, at some point, multipolar neurons suddenly change into a spindle shape with two protrusions, and begin migrating quickly towards the brain surface in a process called locomotion or radial neuronal migration. The mechanism regulating this switch has been unknown. Dr. Ohtaka-Maruyama wanted to know how the massive migration of large numbers of neurons could be organized to form the precise, functional layers of the neocortex. Together with colleagues, she found that newborn neurons in mouse embryos switch from multipolar migration to locomotion at the subplate layer. From this, they hypothesized that subplate neurons could be involved in organizing neuronal migration. 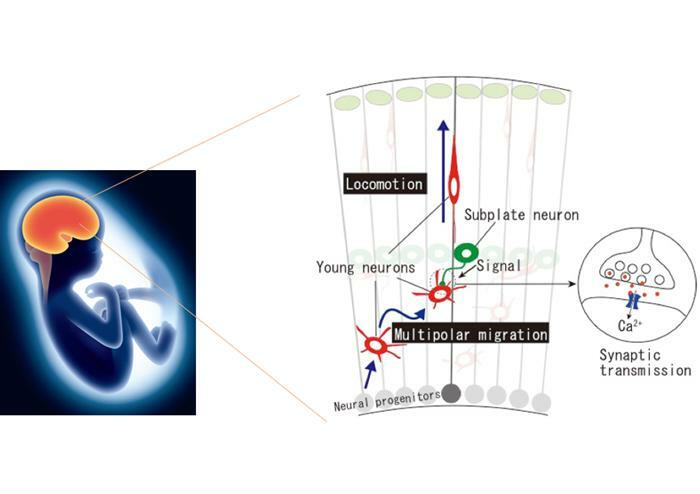 They found that subplate neurons actively extend processes to form transient synapses on newly born multipolar migrating neurons. Communication through these synapses is important for migration, since preventing communication prevents newborn neurons from effectively migrating. Conversely, spritzing newborn neurons with the neurotransmitter glutamate, which mimics synaptic activity, enhances radial migration. These results suggest that subplate neurons may function like organizers at a massively overcrowded time-trial race where organizers decide which racers will run at what time. Various mental disorders such as autism and schizophrenia are associated with defects in locomotion and radial migration. Thus the results from Ohtaka-Maruyama and colleagues will help in understanding the causes of these diseases. Their results will also help us understand how a massively complex structure like the human neocortex evolved. The Tokyo Metropolitan Institute of Medical Science is a public interest foundation funded by the Tokyo metropolitan government. Its goal is to pursue medical and basic research to improve the health and well-being of the people of Tokyo and worldwide. The Institute contains 35 research laboratories, and was ranked as the top research institute in life sciences in Japan by Nature Index 2018 Japan.